In the past I've done several posts talking about how nice it would be if we could all have coffee together. Today let's have muffins and milk while we chat. The muffins are chocolate and pumpkin - they are kind of made up based on a few recipes I studied. They are moist and yummy. The milk is ice cold but I have hot coffee too, if you'd prefer. I set everything up on the three tier tray so you can grab what you want. So how are you doing? Is it fall where you are? Everything is fine here and we are starting to see hints of fall. Our house is on the market but there's not a soul looking. We'll be patient and know that something great will come sooner or later. I'm getting lots of exercise keeping things spotless. Cleaning counts as exercise, right? I'm talking about jeans and whatever I put with them that day. Let's talk about Harrison Ford...doesn't he just get better and better looking? Amen. We got to sit outside on the deck under the trees and stars. It was wonderful! Everything tastes better outside. Don't you think? Fall always makes me miss the days when my boys were little and we'd go to the pumpkin patch. Such fun memories were made then and there. What are your favorite memories or thoughts of fall? In my husband's eyes it's all about Texas Aggies football. I'm glad you were here to share these muffins with me. You can go visit my Thoughts of Home friends today and then we'd love for you to link up tomorrow and share your tiered trays...or any trays you enjoy in your home. Lightly beat eggs. Add eggs and oil to pumpkin and mix until smooth. Add cake mix to wet portion and mix just until lumps disappear. Bake at 350 in muffin tins with or without liners for approximately 20 minutes. These muffins look delicious Stacey! How fun to be joining you in your pretty kitchen this morning, Stacey. 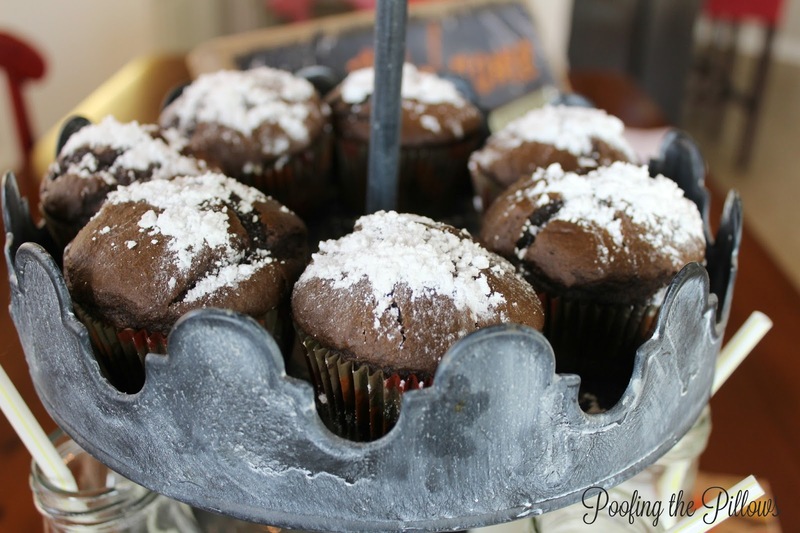 A muffin with chocolate fudge cake in it... yes, please! 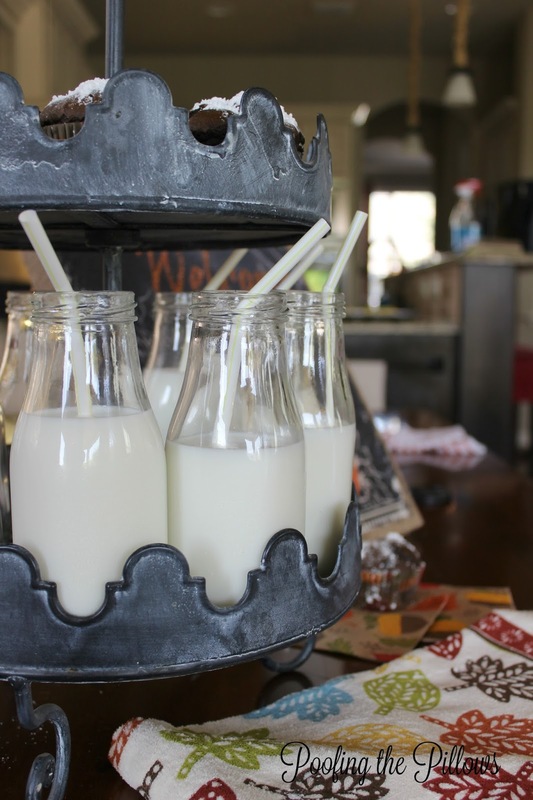 I just love how you set up the serving tray with the little milk bottles. Do you think the housing market is slow due to school starting? Not feeling like fall here yet, although rumor has it that we may dip into the 80s. Keeping my fingers crossed for that. I am ready for fall clothing and could use some fashion tips. I'm going to check out Beth's challenge. Sorry that you aren't getting any lookers on the house, maybe now that kids are settled back in school people will feel like they have the time to look. Fingers crossed! Oh what a great way to serve muffins and milk, love this idea and I would like a muffin too please. Those look delish, Stacey, and so pretty on your tray! Thanks for sharing your recipe. The muffins look delicious. A little cooler here, and by that I mean in the high 80s. 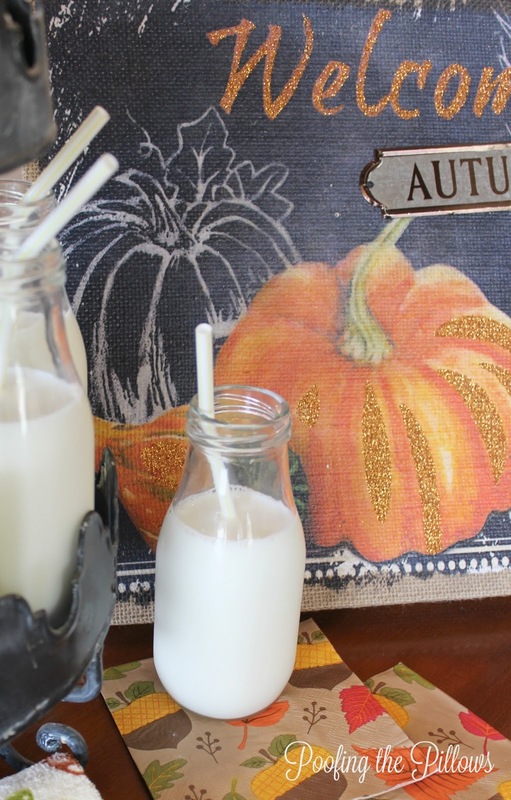 But, I am not letting that stop me from adding fall to our home. So happy you shared the recipe with us, Stacey...my mouth is watering right now! It's too hot here in ATL for it to feel anywhere close to fall yet. Of course, I was in Hobby Lobby over the weekend and the whole store was decked out in Christmas stuff...ACK! I love your tiered tray. Mine is packed away. I have not started decorating for fall really. It is still so hot here. Those muffins sound great. Both adorable and practical! I will do this the next time I have a full house for breakfast. Hey Stacey - I wanted to go see that movie and now you have proven to me that I shouldn't. I am so emotional - I bet I couldn't handle it!!!! As for some of my best fall memories....I would have to say that I miss my annual Fall Harvest celebration that I use to have. I miss all of "my people". I loved growing all the pumpkins and mums and everyone shared in the laughter, good food and all things fall. Those were good times. My son is 14 and he still humors me by going to the pumpkin patch....God love him. I know those days are numbered so I'll enjoy them as long as I can. Hope you have a fantastic fall! Thanks--I'm in the mood for a nice moist muffin and glass of milk! I like to make muffins with my granddaughter as its easy for her to mix them in a bowl and measure out the mix in a muffin tin with a small ladle, and of course she loves to eat them afterward! I had gap years of not going to the pumpkin patch but happily the grandchildren now keep that tradition going. We visit a really nice farm a county away that has lots of activities, including a corn maze and barrel rides. The mornings and evenings are cool and crisp but the middle of the day still gets hot...Colorado sun is intense. I hope some house buyers come your way soon! I know they will love your house once they see it! Seriously, fall fashion is the best! I'm not sure I can commit to a "closet cleanse". I harshly cleaned out my closet in the spring, and now I'm scrambling to find things to cover my backside for fall.....well, at least my arms! I'm having to replace my jean jacket. Who gets rid of their jean jacket? That right there is essential clothing! What a sweet post. I love how you displayed those yummy looking muffins and milk. Now that the temps are finally getting comfortable, I am thinking of fall decor. No movies lately though. Fall will be a great time to catch up with a few. It would be a pleasure to join you for coffee and muffins. Stacey, your muffins looks delicious! No fall here yet, luckily, it's still 86°F during the day. It was so nice chatting with you and having one of your delicious muffins Stacey. Love the tiered tray idea for serving them! I like the finish on your tray too. I haven't watched any movies at the theater lately, we always rent a DVD for our Sat pizza night at home. Harrison Ford ... yes! I have admired him since Star Wars when I was just a young tweenie ;) Fall to me is hiking in the woods with the fall colour all around me. Plan on doing that in two weeks time for our fall camping trip. Muffins and Milk!!! Yummy! Your muffins look great. I agree about Harrison Ford. He just keeps getting better. Have a great week! Oh Stacey, that recipe sounds so good and easy! I recently deoorated two tiered trays for Fall, one for the dining room and one in the kitchen. I am looking forward to the link up! I took my granddaughter to see Pete's Dragon this past Friday and it was such a wonderful movie! We both loved it! I do love Fall clothes and have been picking pieces up all summer in anticipation. I have also found a new love for leather jewelry. A new trend seems to be a long pieces of thin leather with beads on the bottom that you can wrap around your neck and then just drape down the front. So pretty! I also got a leather bracelet from Magnolia Farms. Hi Stacey, I love your cute display of bottles and muffins! Wonderful fall treat. I love fall clothing as well. I'm sure someone will come along and fall head over heels in love with your home. Cute, cute tray. I'd love to have coffee with you for real. Thanks for your help. Hopefully, I'll be back tomorrow for the Tiered Tray party. 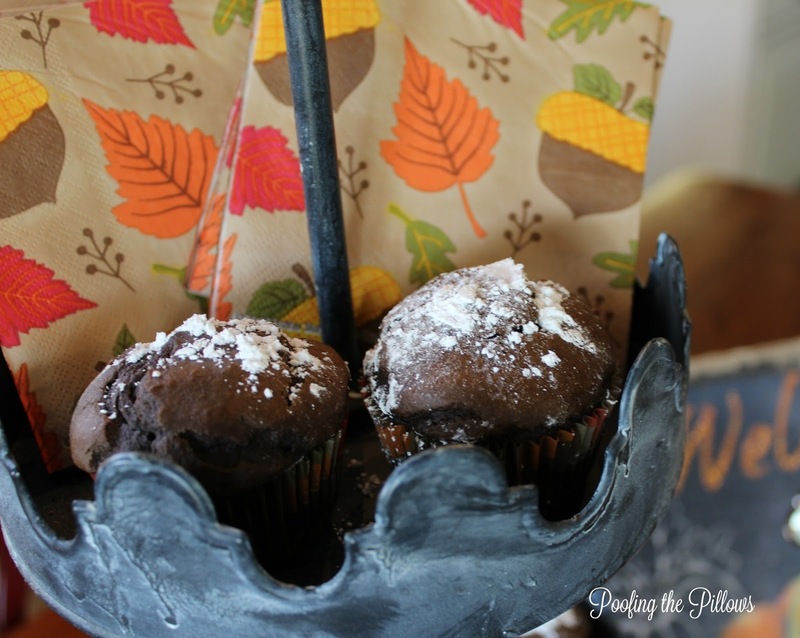 What a sweet tray full of yummy pumpkin- chocolate muffins and milk. A great combo. I would love to have a cup of coffee with you anytime. Those muffins look delicious and I love those cute milk bottles! I would love to share one with you! Can't wait to see the other tiered trays! I enjoyed my visit with you, Stacey! I felt like you were visiting just with me. You tiered tray looks so pretty and those muffins...why I'd just love to try one, and they're so easy, too. Thanks for checking out my visit to paradise! Looking forward to getting to wear my Fall clothes. Ready for a change! OH Stacey, cold milk and homemade muffins are the perfect pairing, and arranged on your awesome galvanized stand, everything is irresistible! Very lovely, looks like a magazine cover- thanks for the fun link up! Thanks to all of the ladies for such a fun party! Unique idea, and it looks yummy!! Hi Stacey, I love your pretty tiered tray displayed with milk and muffins! I can't wait to make those muffins. Thanks for sharing the recipe to make the muffins at Cooking and Crafting with J & J. Your tiered tray is so inviting. Love those milk bottles. I wish I was really there! :) Those muffins look delish and I'm sure they would be wonderful with a cup of coffee. I love milk too though! Your tray is lovely and a great way to serve. Fall is my favorite season! I just about despise summer clothes ~ seems we just wash them to death and I so dislike summer and our brutal heat. I did love the temps this past weekend ~ such a nice change! Love wearing jeans, socks, jackets, etc. So much more fun than summer clothes. Your tray looks so inviting! The recipe sounds delicious. 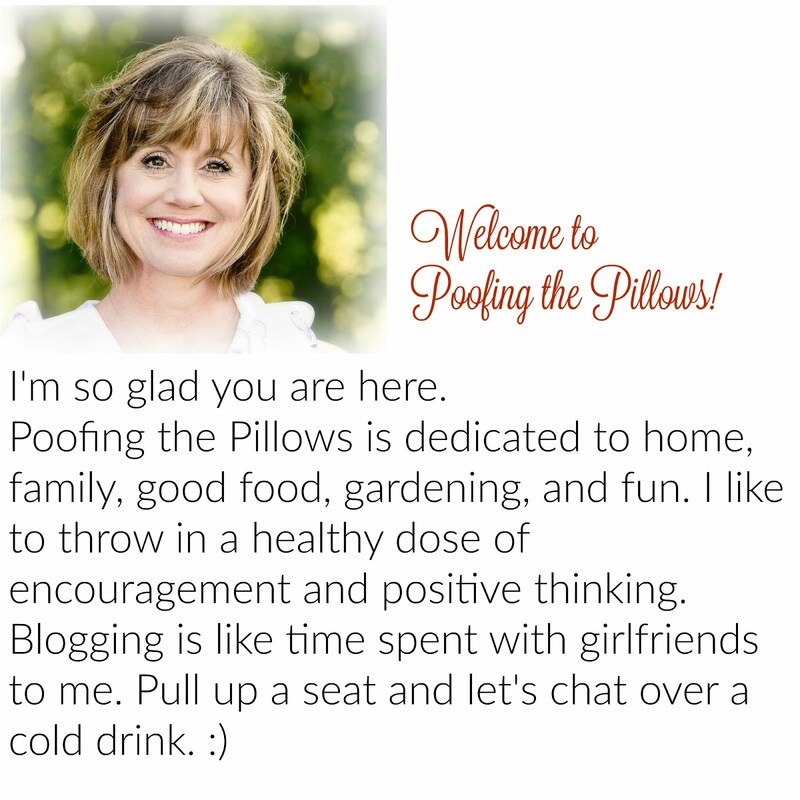 I am pinning and trying very soon. Thanks so very much! I'm so in love with that tiered tray. That recipe looks pretty dreamy as well. I'll have to give it a try. Visiting from Share Your Cup. Stacey, Chocolate muffins is always a favorite of mine. 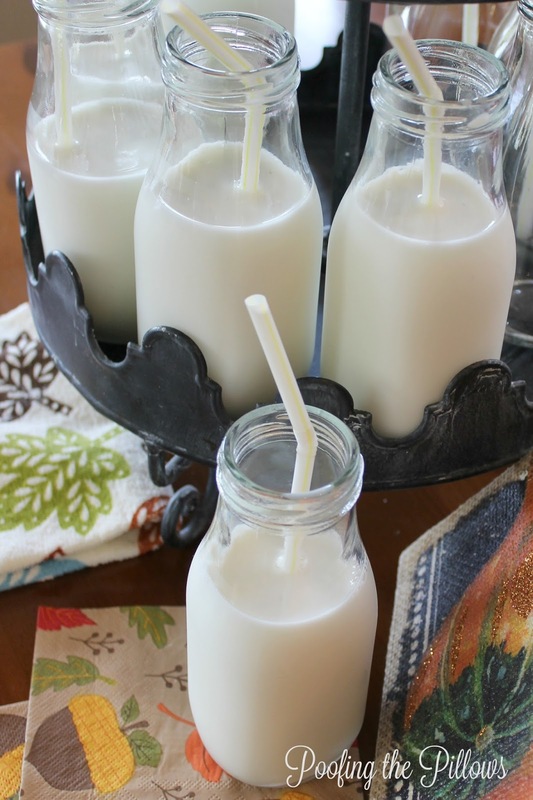 I love the milk in jars. Thanks for sharing. Sylvia D.
I adore your tiered tray, and those muffins sound delicious! I also adore Matt Damon, so Jason Bourne was a must-see! YES, Harrison Ford does get more handsome with age. He hasn't lost that crooked smile and mischievous twinkle in his eye that made me swoon over Han Solo! Hi Stacey, I featured this at our Monday Cooking and Crafting with J & J Link Up! Thanks for sharing with us and have a wonderful week. All my favorite ingredients. Yummy and I am so happy you shared at Dishing it and Digging it link party. We love having you.